Worrying is second nature to someone who struggles with Anxiety. Add children into the mix and that worry is magnified. Many concerns about our children are largely out of our control but when it comes to safety in and around the home there is some action we can take to help prevent accidents. I’ve teamed up with Max6Mum Security today to share a new campaign they are working on specifically around window safety. I’ll confess that window safety isn’t something I’ve given much thought to in the past, except when it comes to blind cords etc but, unfortunately, figures show around 4,000 children under 15 years old fall from windows each year in the UK. 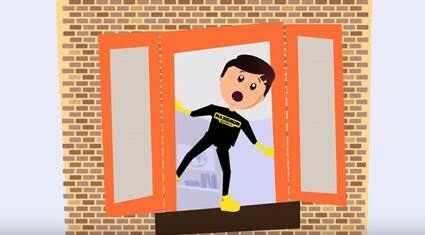 Kids learn best when they are entertained and the catchy tune of this You Tube video is really engaging for young children and a great way to help them to remember the basic rules of window safety. The campaign is also accompanied by a wonderful hardback book, illustrated by Kamila Kasperowicz. The book discusses several different scenarios where characters are at risk of injury from windows, all depicted by Kamila’s simple, modern illustrations. It delivers a serious message with a lighthearted approach and I found it really useful for discussing these dangers with my four year old, without scaring him. I like that the scenarios described in both the book & video are very varied and can span age ranges from toddlers to teens. One example includes a toddler being distracted by a butterfly before falling from the window, another shows two slightly older children play fighting near an open window and a third gives the example of a pre-teen is leaning out of the window to get better phone signal. These different ideas ensure the message gets across to kids of all ages, rather than just tiny tots. Plus, it was a real eye-opener for me as a parent too because, although we are extremely vigilant when it comes to keeping toddlers safe, it’s easy to become complacent as your child gets older. As well as at home, showing this video or sharing the book in schools would be really useful too. Even 30 years on I still remember when the police officer visited our school to talk about road safety so clearly, if delivered correctly, this information can stick with our kids for a long time. This window safety campaign is actually just the first in a series from Max6mum, with future episodes featuring additional child safety concerns such as answering the door to strangers, playing with cleaning products and internet safety. For more information, visit www.max6.tv or watch the video below. And for your chance to win a copy of the book just enter the giveaway at the end of this post. Disclosure: This is a collaborative post with Max6mum Security, words and opinions are all my own.